Apply one Applicator to one area of your choice (such as the abdomen, back, sides, legs, arms, or buttocks) and leave on for 45 minutes. Remove and discard. Repeat after 72 hours. Question: What is the Ultimate Body Applicator? Answer: The Ultimate Body Applicator is a non-woven cloth wrap that is infused with a powerful, botanically based formula to deliver maximum tightening, toning, and firming results in as little as 45 minutes. It continuously hydrates for firmer, smoother, more youthful-looking skin, and reduces the appearance of cellulite and loose skin. Question: How long do the results from the Ultimate Body Applicator last? The results you see from the Ultimate Body Applicator are not temporary, as you may have experienced or heard about with many body wraps that simply cause water loss. The Ultimate Body Applicator helps tighten, tone, and firm in a manner that produces lasting results and without water loss. While results are lasting, you can counteract the results by eating poorly and not regularly exercising. Applying Defining Gel will enhance the results of the Applicator. Question: How does the Ultimate Body Applicator work? Answer: While many body wraps simply cause water loss, the Ultimate Body Applicator uses a botanically based cream formula that gives you tightening, toning and firming results that last. The botanical ingredients help to deeply hydrate and nourish the skin while reducing the appearance of cellulite and redefining the appearance of your body’s contours. How the ingrediants in the UltimateBody Wrap by ItWorks, works! Provides astringent and anti-inflammatory benefits for products treating reddened, irritated or sensitive skin. In Germany, extract from its seed has been approved to treat poor circulation to the legs, leg cramps, swelling, and non-specific leg heaviness. Traditionally used for its ability to reduce varicose veins and to treathemorrhoids. Green tea is known to contain two active groups of chemicals known as xanthenes and polyphenols or catechins. The xanthenes include components such as caffeine, theobromine and theophylline. These active agents have been demonstrated to suppress inflammation and irritation, and more recently, they have been shown to reduce cellulite. Polyphenols (also known as catechins) exhibit powerful anti-oxidant properties, which play an important role in the prevention of cell damage. Consequently, green tea extract is considered to play a vital role in protecting the cell from free radical damage initiated by environmental factors such as exposure to UV light. Powerful antioxidant components help prevent or delay skin aging. Applied to the skin,it acts as an anti-inflammatory agent. Studies at the Department of Dermatology in Strasbourg indicate it is a strong anti-inflammatory agent, effective in the treatment of wounds, ulcers and lymphatic edema. Particularly suited to the fragile skin around the eyes. Hydrocotyl extract assists in reducing inflammation and sensitivity of the skin. Tightens the skin and increases the elasticity. Hydrocotyl extract is used in Indian Ayurvedic medicine to combat excessively dry skin. This herb has a long history as an effective treatment for damaged and tired skin. Used for its astringent, tightening, and firming properties on the skin. It helps heal wounds. It also helps to improve the elasticity of the skin. The herb helps eliminate excess oil from skin and hair. Coadjutant in treatment of wrinkled skins. Disinfectant, stimulating, clears skin blemishes by reducing excessive oiliness. Promotes the regeneration of skin tissue. Valued for its awakening and revitalizing fragrance. Eucalyptus oil has blood stimulation properties (A vaso-dilator that improves bloodcirculation), beneficial for the treatment of hair loss and cirulation. It has antiseptic, cooling and stimulating properties. Eucalyptus oil has antibacterial, antifungal and antiviral properties on the skin. It can also be a skin irritant, particularly on abraded skin. Derived from the dried Thallus (bulbous root) of Fucus Vesiculosus, a type of seaweed. It is rich in the same vital nutrients, trace elements and amino acids present in human blood plasma, allowing it to penetrate the skin more thoroughly than most other ingredients. It speeds up the elimination of toxins from cells and is a natural cellular renewal ingredient. It also helps to nourish and remineralize the skin. High in silicon, which is believed to keep the skin from wrinkling and sagging, it is used for its anti-inflammatory and revitalizing properties. Extracted from the evergreen climbing plant. Ivy is well known for its toning, tightening and skin refining properties. Ivy Extract has slimming and anti-cellulite properties,as it prevents water accumulation in skin tissues. It is antibacterial and soothing in cases of sunburn. Ivy Extract is currently being studied for its vasoconstrictive properties, due to its Vitamin P. Lowers tissue sensitivity, activates circulation, and helps reduce local inflammation. Ivy has a long history in folk medicine for use in cases of skin eruptions and skin ulcerations. It is also widely used to dress wounds and treat pus-exuding sores. Coadjutant in treatment of wrinkles. A natural cooling agent, derived from mint oils. Anti-inflammatory and anti-itching to the skin. Imparts a cool, fresh and clean feeling to the skin. Has a soothing property if used in concentrations of 1% or less. * These statements have not been evaluated by the Food and Drug Adminstration. FACT: Users must be realistic about the change they will see based on the level of damage to their skin. FACT: Users must adhere to the wrap rules, clean skin, lots of water, not toxins, fat, sugar in the 72 hours after the wrap. You need to be drinking half your body weight of water each day. FACT: If it is con why are so many people who have had success with the wrap? search ultimate body wrap results on google and you will find hundreds of images from accross the globe of succesful results. We it works business owners dont have the time to sit and photo shop all day. I am a busy Personal Trainer, Fitness Class instructor and Marriage Celebrant, I dont have time to sit and photoshop my pictures. I share ItWorks products due the healing qualities they have, and in my limited spare time. FACT: There is NO obligation to buy, after the THREE months but like any subscription, you need to cancel it yourself. Our customer services team are always happy to cancel autoships. All contact details are on the invoice you recieve with your products. There is never any reason why your autoship should continue, unless you dont cancel it yourself. FACT: As a personal trainer ( http://www.getfitwithzahra ) If you were to diet/exercise and lose weight or body fat, and you begin to eat unhealthy, fatty, sugary & processed foods and not get any activity, you will gain it back…agreed? The wraps work the same way! 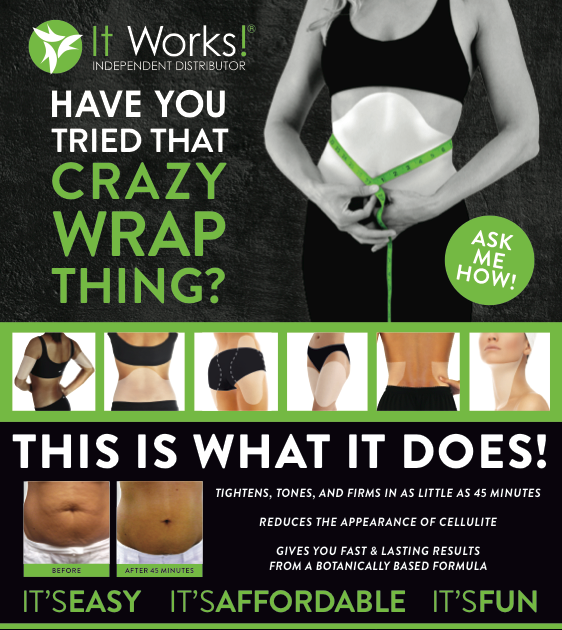 After you wrap, you will gain back what you have lost if you live a unhealthy lifestyle. But, if you continue to eat good, healthy foods and live a healthy lifestyle, your results will remain permanent! B. There is a cancellation fee if you terminate your 90 day challenge before there end of the 90 days. This is only fair, if you have products at 40% discount, but you do not complete the 30 days this fee is set in place. Its like when you sign a 12 month contract at the gym, you have see that through. As an ItWorks business owner, I ensure that USERS are informed of this, dont blame the product bad business owners! FACT: Amazon is not an Authorised Distributor of ItWorks, sellers on Amazon, are selling products are out of date. This is not a problem soley related to ItWorks, other companies are experiencing this as well. Former business owners ARE selling out of date or unwanted stock for a reduced price. The way I see it is, why would you buy something for your body from a third party that was potentially out of date, when you wouldnt put something in your mouth that was out of date? FACT: Flick to google images, where you see that every single before and after pictures of which there are 1000’s, is a good review of ItWorks products. If you compare the number of before and after pictures, to the number of bad reviews, you will see these before and after pictures are proof enough these products work. FACT: Seriously! you have just had your most scared body parts photographed, because you have WRAPPED THEM!! do you really want your neighbour acrross the street to know its you? Users permit us to use their before and after pictures, but many like to keep there idendity private to them. I would ask you, if you wrapped your tummy, would you have your face photographed? I suspect not?? ?